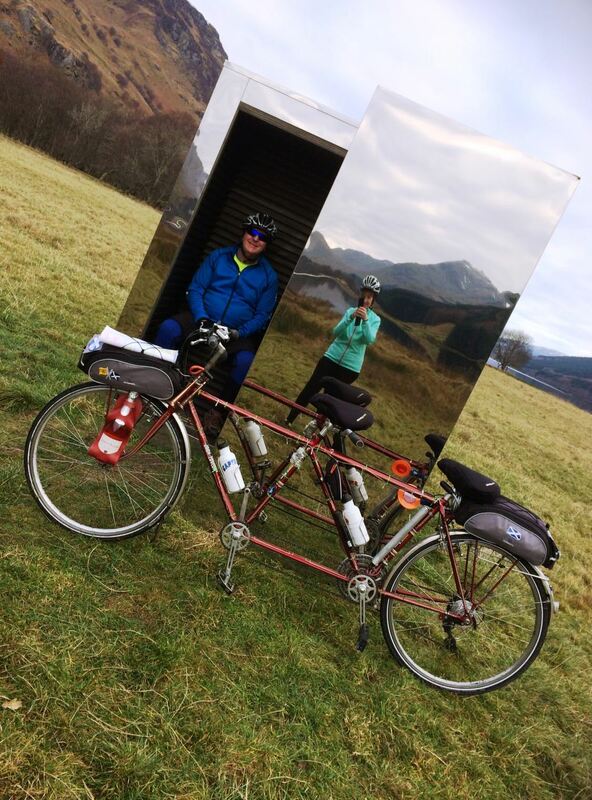 Reflections on the BLiSStrail – Team Matilda at the Look Out mirrored cabin at Loch Voil. What excitement at Matilda’s Rest! 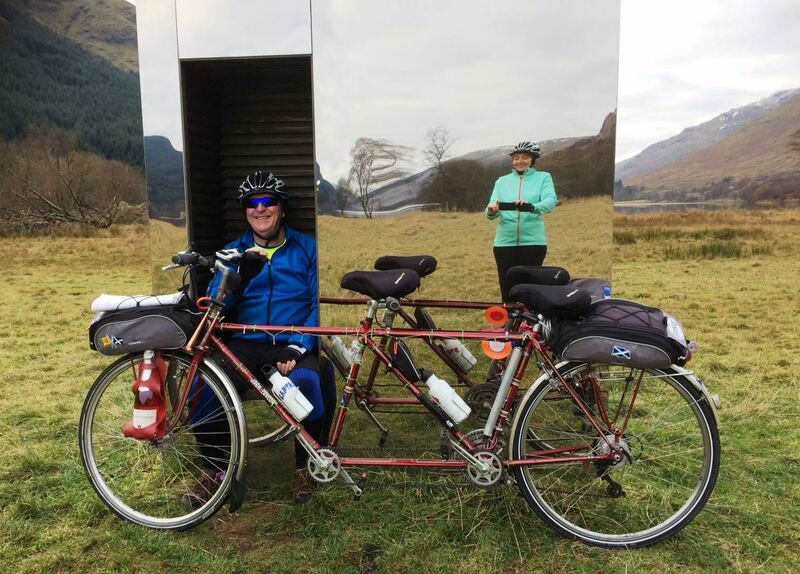 I have been hardly been able to sleep since this “old lady” tandem was invited back to the Loch Earn area to do another blog on their fascinating cultural outside art #BLiSStrail. Yes I will say that again, invited back! It seems that LETi, the local Loch Earn Tourism Information group, was so impressed with my photo and video blog from my trip to see the first section of the art trail at the end of October around the St Fillans and Lochearnhead loop that they asked Team Matilda to come back and do another blog on one of the other two legs of the trail – this time around Balquhidder. 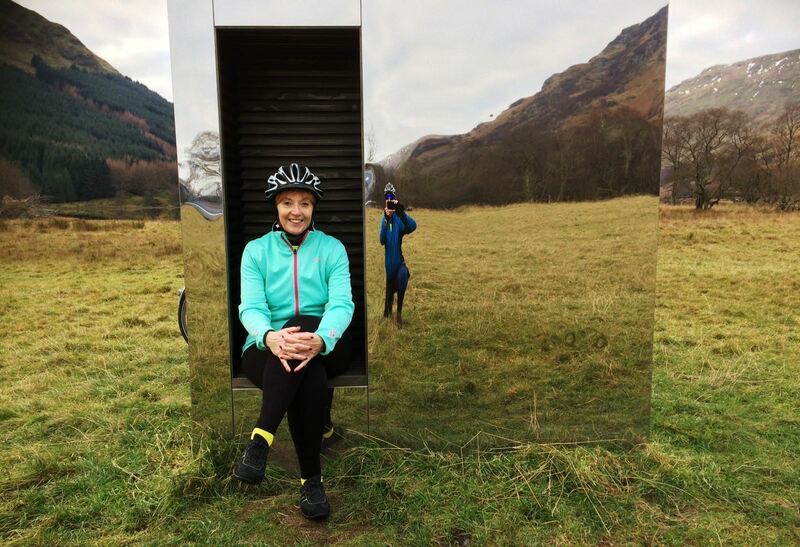 The unique BLiSS trail is named after the four villages it links – Balquhidder, Lochearnhead, Strathyre and St Fillans – deep in the heart of Rob Roy Country within the Loch Lomond and The Trossachs National Park – where Perthshire meets rural Stirling. The trail is made up of a series of large ornamental metal and wood sculptures and art installations, mostly by various artists, to commemorate the Year of Innovation, Architecture and Design. The “old git” and the “old gal” were delighted to accept on my behalf. So on Saturday afternoon I was packed into Matilda Transport and we headed off through St Fillans and down the side of stunning Loch Earn, through Lochearnhead on the A84 to The Golden Larches bed and breakfast – Team Matilda’s base for their mini-weekend adventure. There my dynamic duo were met by the extremely hospitable owner Alistair Buchan – who showed them the first of the art installations along this section of the BLiSS trail – Sunflowers by Kev Paxton – situated in the car park of The Golden Larches, opposite the old Balquhidder Station. The first iconic piece of art I got to see was the giant Sunflowers..
You certainly can’t miss this sculpture as it is 4m high – somewhat larger than the common sunflower! It certainly towered above me, and I am sure the giant sunflowers turn heads and raise a few smiles on the A84. Given that this is a pre festive tour, the next person I was introduced to was “wee Santa” who was on hand to make me feel welcome at my new abode for the evening! Ho! ho! ho! 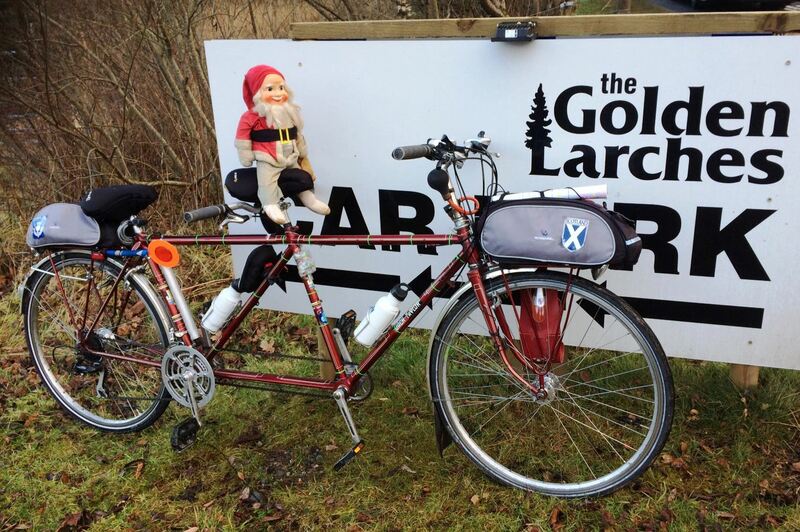 Here I am making my acquaintance with “wee Santa” at The Golden Larches. Alistair couldn’t have done any more to make my dynamic duo comfortable on what was a somewhat chilly night. 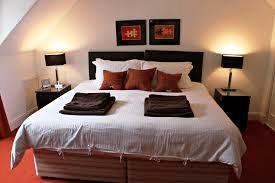 They were shown to their lovely, relaxed, warm and welcoming room. He even went the extra mile when the “old gal” suddenly proclaimed that she was in danger of missing her favourite tv show – Strictly Come Dancing – when they went out for dinner. After a bit of relaxation the “old git” and the “old gal” ventured out to sample the dinner menu at the highly recommended MHOR 84 Motel which serves food to satisfy the many cyclists and walkers who pass by. To fuel up for the ride ahead the next day, my dynamic duo stocked up on a meal which tantalised their taste buds – scallops, burgers and cheesecake, washed down with the obligatory red wine! 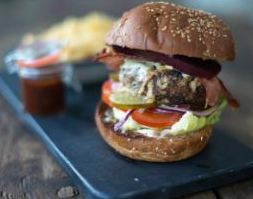 The amazing burgers at MHOR 84! “Home from home” comforts at the Golden Larches. On return to The Golden Larches my crew reveled in what the “old git” described as “home from home” comforts – and give his exacting standards of what makes home comforts that is praise indeed. And after Alistair’s heroics with the tv set box, my dynamic duo were able to be very decadent and (whisper it) watch Strictly in bed! Then it was time for some zzzzs before an early alarm call to hit the BLiSS trail. So Sunday dawned and my crew were up before dawn to have a very tasty breakfast, home cooked by Alistair, before I was set up for the day’s tandeming ahead. Before we headed off I was very honoured to get to meet Kim Proven, the livewire chair of LETi and owner of luxury self-catering Briar Cottages at nearby Lochearnhead. 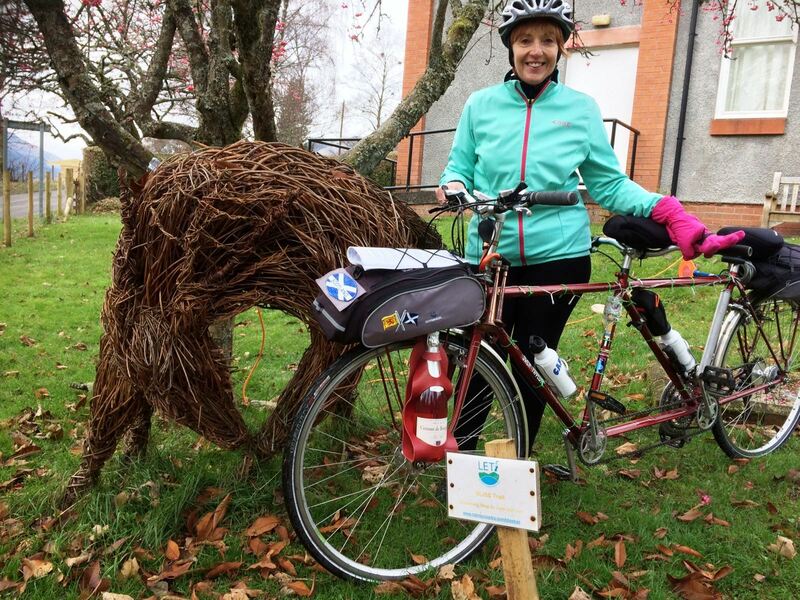 And she even brought along the Scottish Thistle Award the BLiSS trail won recently as a prop for photos. 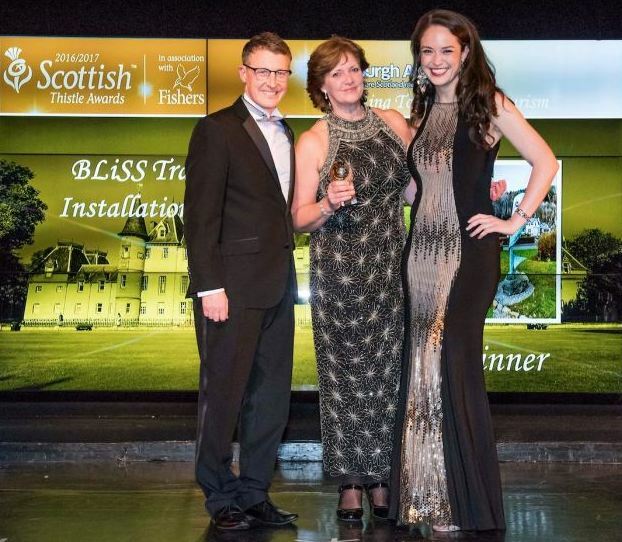 Two livewire ladies – me posing with Kim and the BLiSS trail Scottish Thistle tourism award. Kim uses every opportunity to publicise the area to get people to come and see the natural beauty of the area for themselves. And that’s probably one of the reasons the trail got noticed by the Thistle Award judges in the first place! The “scrubbed up” version of Kim receiving the ScottishThistle award from STV’s Jennifer Reoch. The BLiSS trail is designed to encourage visitors to smile, stop and spend time in the villages – and all the installations are near cafes and restaurants. Now for those of you who haven’t looked up the dictionary to find out what bravura in my headline for this post means – let me explain. It is used as in “a display of great bravura” which really means a display of great technical skill, brilliance and daring. And this “old lady” thought that it summed up the outdoor cultural BLiSS trail brilliantly! Because it was only three weeks till Christmas, the “old git” – who is a real Crimbo lover – decided that a few festive shots had to be taken – complete with fetching Santa hats! I must say I thought that Kim really suited the “old gal’s” animal print trimmed one! The “old git” and Kim getting into the Christmas spirit along with “wee Santa” and me! 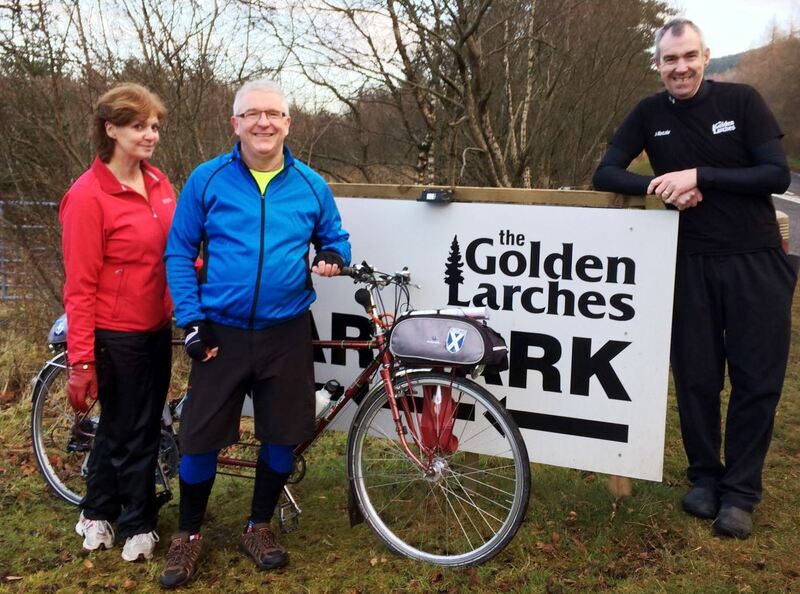 Here I am with Kim from LETi, the “old git” and Alistair – mine host at The Golden Larches. The “old gal” was being kept busy in her role as my blog photographer and – despite the freezing temperature – there was time for a quick shot with the “old git”Kim and Alistair before we left The Golden Arches, full of praise for our stay. 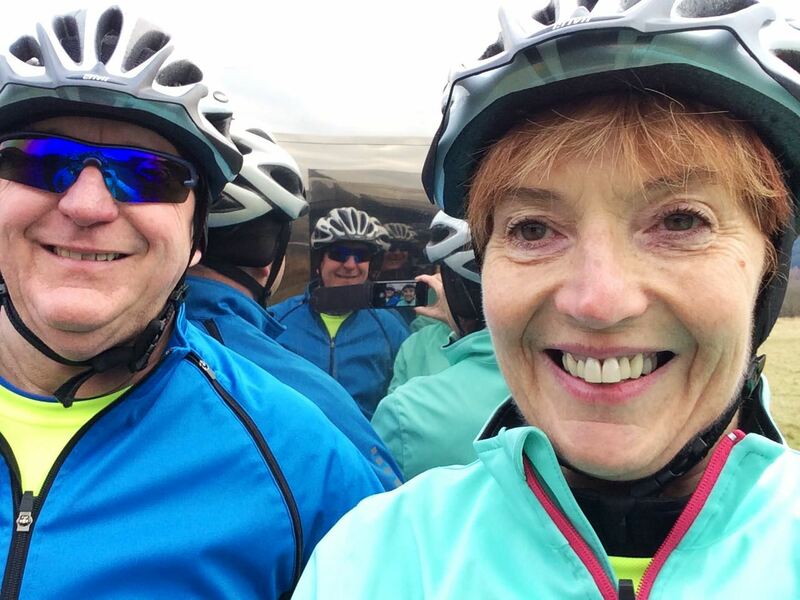 Now Kim, who is a self-confessed tandem virgin, and who has actually had very little experience of riding a bike at all – gamely accepted the “old git’s” challenge to take a shot as temporary substitute stoker – while the “old gal” gave up her back seat role (and crash helmet!) to film the attempt. So can you guess what happens next ….. Did Kim manage to put her faith in the “old git” as Captain and hand over control – or did it end in disaster?! So it was a success! Congratulations to Kim! This “old lady” says she was a natural – although the “old git” is telling anyone who will listen (and there are not many!) that he is a good teacher and was very gentle with Kim being a newbie and that he didn’t change my gears and avoided any tight corners! But he is asking why she didn’t take her hand off my handlebars to wave to the camera! 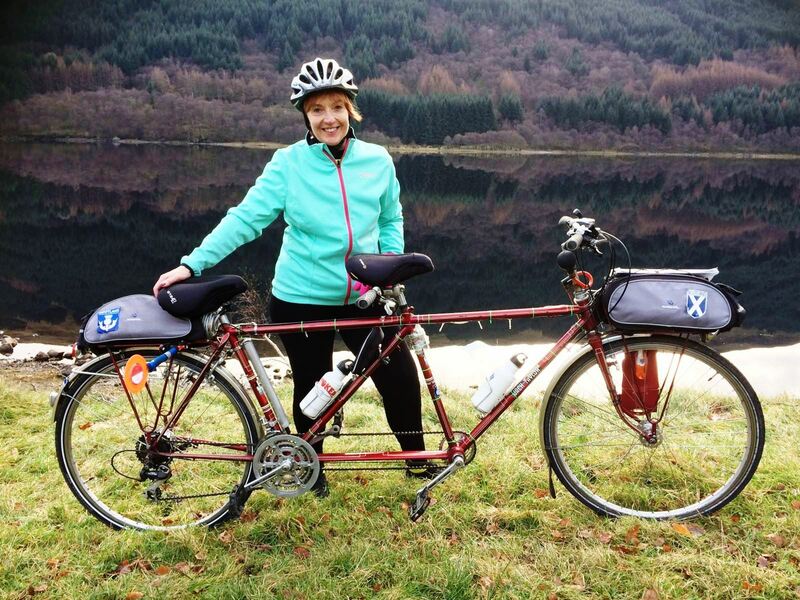 As for Kim, she was delighted with her first ride on a tandem and – believe it or not – wants to have a second go on me! Maybe she and her husband will become tandemers! Team Matilda bid fond farewell to Kim armed with a detailed map of where to find each art installation and feature along the way. 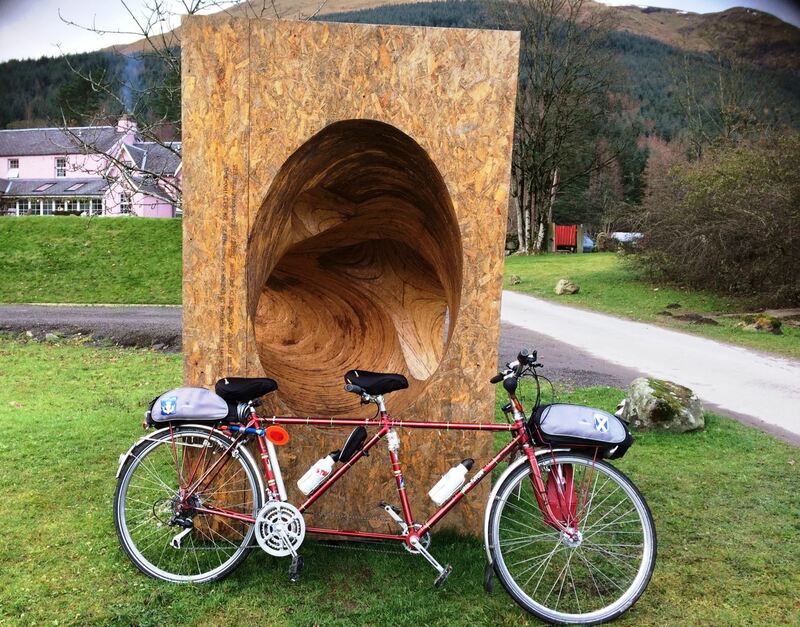 You can check out the details of our scenic route on the BLiSStrail around Balquhidder on Strava below – and don’t forget to click on the map image to get the full data and statistics! 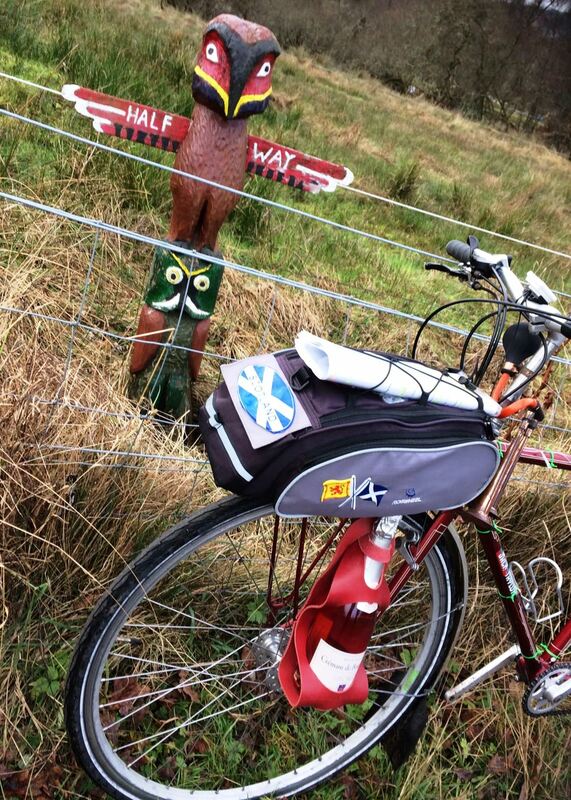 Firstly we headed back about a mile on Sustrans Scotland Route 7 to see The Cockerel – a Sustrans Millennium Mile Marker. Four artists were commissioned by Sustrans to create distinctive mile markers for each part of the UK. Scottish sculptor Ian McColl created Scotland’s design – known as The Cockerel. 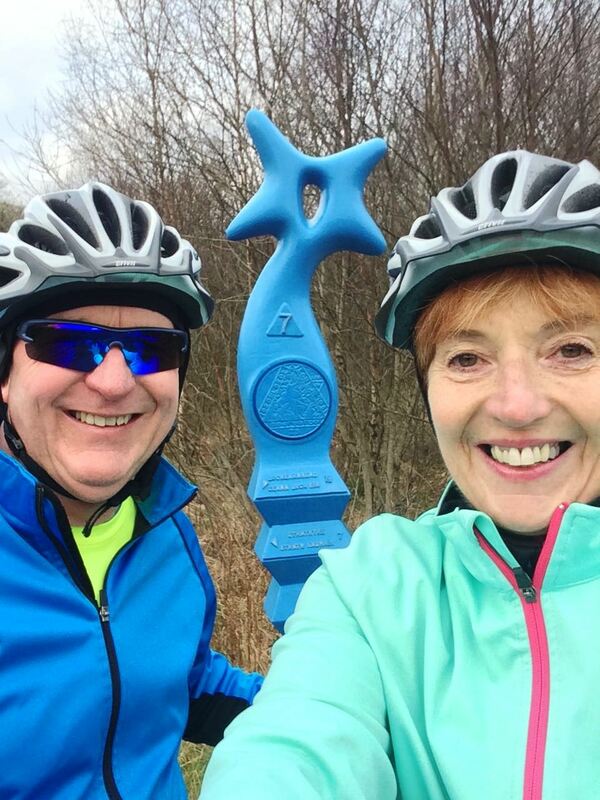 The scenic Sustrans Scotland route marker on National Cycle Route 7. 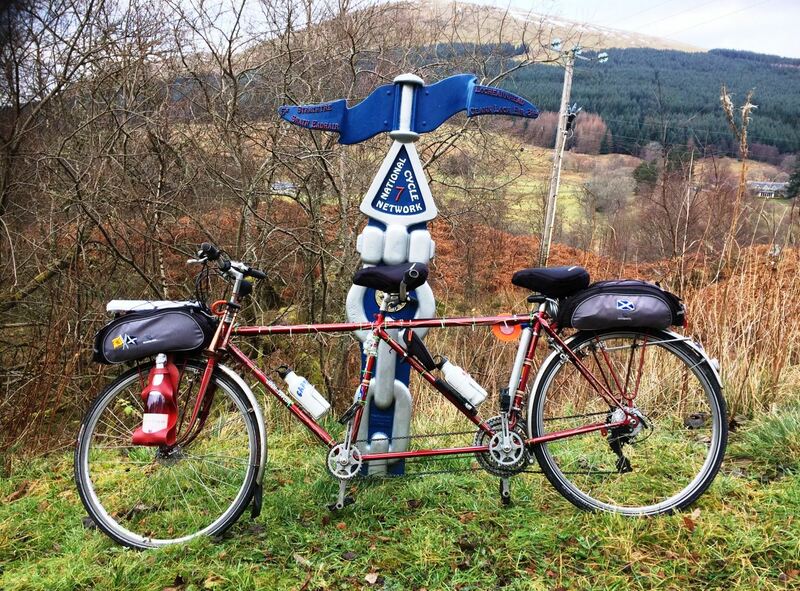 We cycled on to the Balquhidder turn off from the A84 where there are two features almost side-by-side. The first is a recently restored cast iron Victorian signpost – with one arm pointing to Rob Roy’s Grave 2 miles away and the other to destinations including Oban. They don’t make them like they used to! The “old gal” and me at the Victorian sign. Opposite the signpost is the iconic red phone box – which still works! It has been used, and photographed, by many a cyclist, walker and visitor to the area. Who you gonna call? 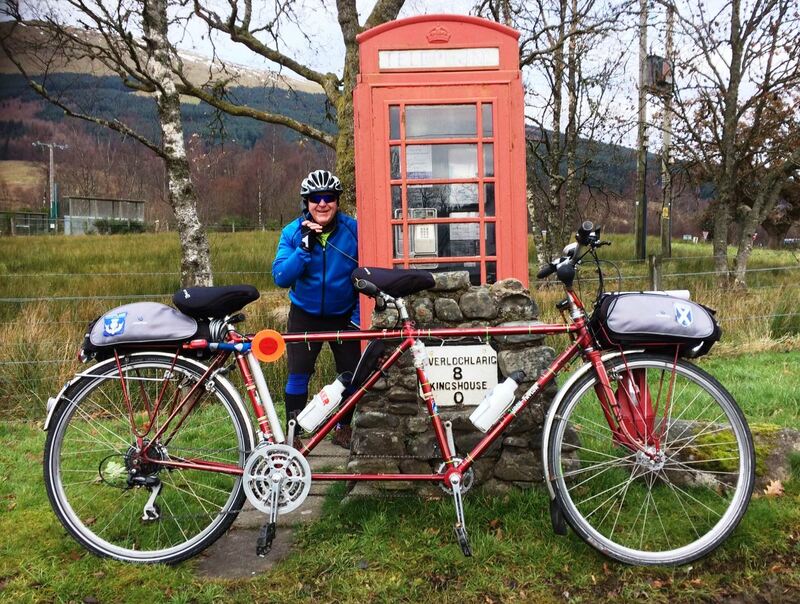 The “old git” holding on the line at the iconic red phone box! 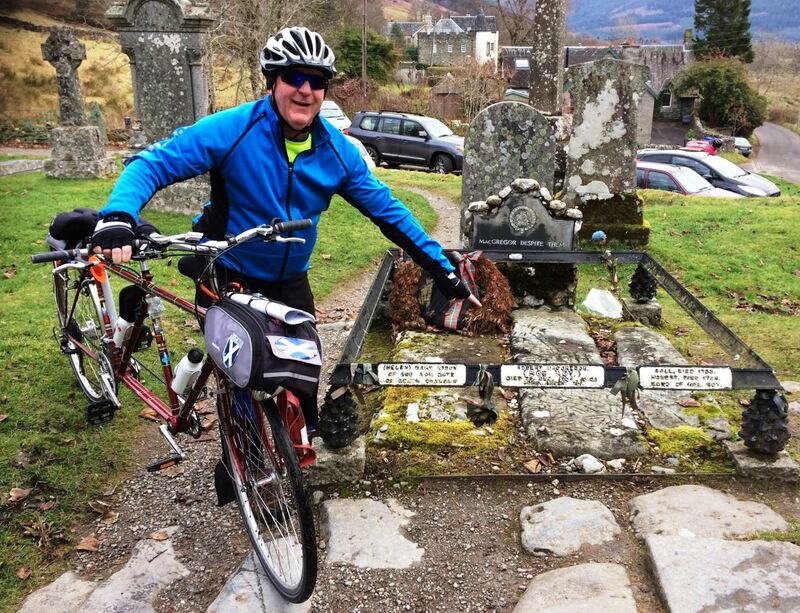 On we tandemed towards Balquhidder, but you can’t visit here without stopping at Rob Roy’s Grave for a photo opportunity! As you enter the village from the east, a spur leads to the village kirkyard. Here you find Balquhidder’s Parish Church, the ruins of the Old Church it replaced, and the grave of Rob Roy MacGregor. Alongside him lie his wife and two of their sons. The “old git” and me at Rob Roy’s Grave in Balquhidder for the obligatory photo. The “old gal” with the Grooming Stag – a feature at Balquhidder village hall. The “old gal” then noticed an additional interesting feature beside the village hall – another of the iconic red phone boxes … but this one has been turned into a book exchange for the local community. What a wonderful idea! The “old gal” flicking thru the pages of a book at the exchange – hope we don’t need to put out an SOS! Our map then took us about half a mile off our main route, along the road to Strathyre, to find one of the most unusual artworks on the trail – the Half Way Totem Pole. The Half Way Totem Pole serves as a market for a local traffic rule. Now it would need to be said that my dynamic crew were looking for a high totem pole and almost missed this feature. But they are glad they didn’t! The mini totem pole has been created by Balquhidder local Edward Chadfield. The unconventional traffic sign serves a purpose on the single track road it sits beside. When meeting a vehicle coming towards you, the local rule is that whoever is furthest from the half way point does the reversing! Fortunately I didn’t have to reverse and my crew had plenty of time to get a good photo. Selfie time for my dynamic duo looking towards the vista of Loch Voil. 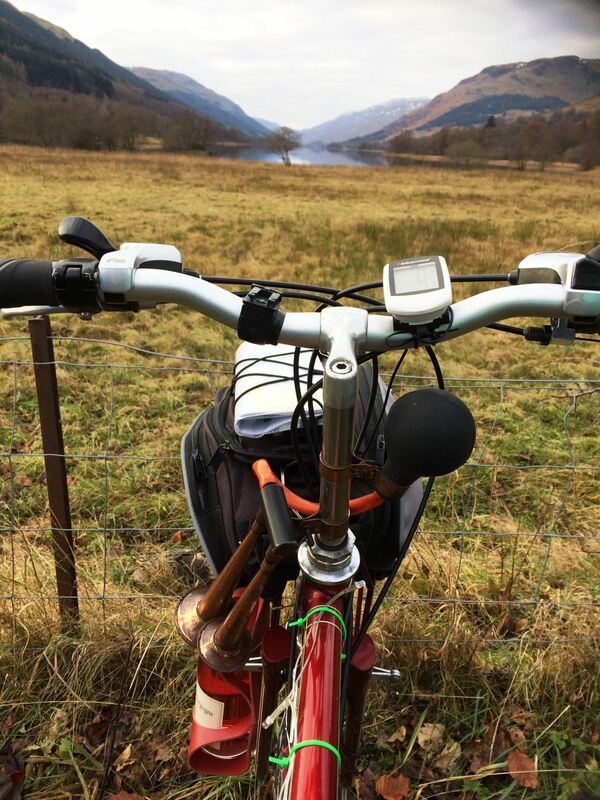 The remote beauty of Loch Voil through my handlebars. We retraced our steps back to the main route – with four miles to go till our lunch break at the end of the loch. 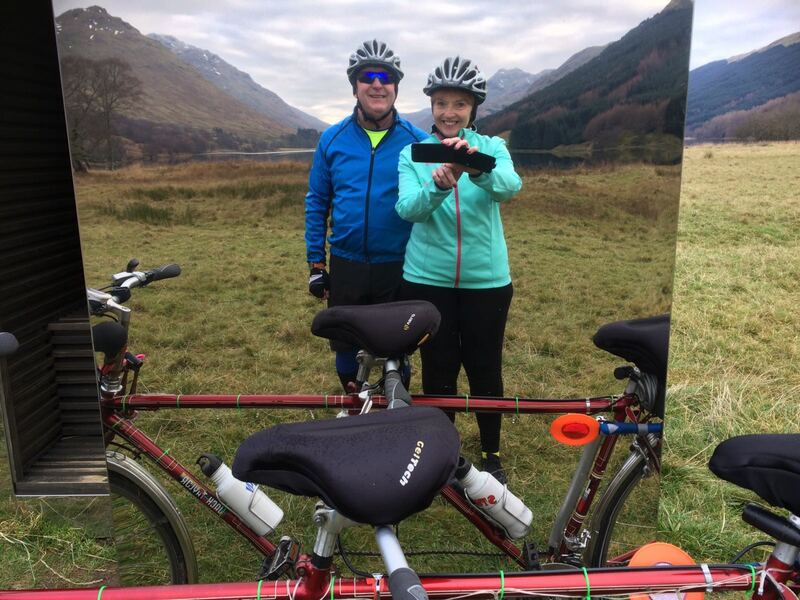 This ride was one of the best Team Matilda have had the pleasure of experiencing – gently undulating single track roads with the most wonderful views across Loch Voil. And with hardly a whisper of wind, the loch’s surface was like a mirror, reflecting the surrounding hills. Just magnificent! The “old gal” and me on the edge of the flat calm and reflective Loch Voil. We pedalled on looking for more of the art installations. The Look Out, situated just at the end of Loch Voil before the neighbouring Loch Doine, was Team Matilda’s favourite on the BLiSS trail. The Look Out was my dynamic duo’s favourite on the cultural BLiSStrail. 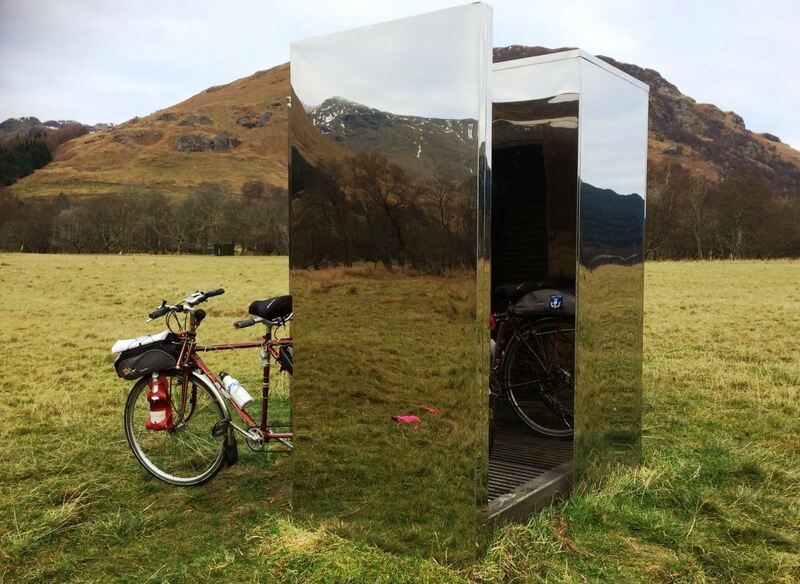 It is essentially a mirrored cube which blends into the surrounding backdrop. In fact it is so well situated that my dynamic crew really had to look to find it in the middle of a field! The “old gal” in reflective mood at the atmospheric Look Out installation. The Look Out was created by Daniel Tyler and Angus Richie as part of their final year thesis project while studying for their Masters of Architecture at the University of Strathclyde. It provides “a place of contemplation framing views of Loch Doine and Loch Voil whilst disappearing into the backdrop of the surrounding glen.” It also provided my crew with the opportunity for a few fun photographs, and I even got in on the act with the mirrors making me even longer than I actually am! The “old git” on one of the seats which amplifies distant waterfalls and bird calls. To infinity and beyond! Clones of the “old gal” and the “old git” in the mirrors! Here I am longer than ever thanks to the effects of the mirrors at the Look Out! 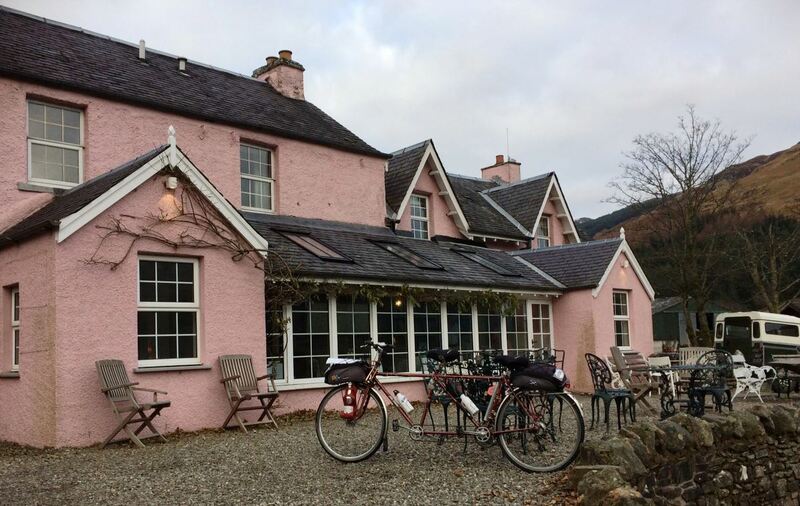 Team Matilda forced themselves away from the sanctuary of the Look Out and found the next two cultural features within the grounds of the stylish boutique Monachyle Mhor hotel. The Cave is right at the entrance – made of Oriented Strand Board – a material often used in the construction industry but rarely shown off. A group of MHOR micro project students created a hand sculpted installation which just demands to be explored and photographed inside and out. The Sheiling is also based within the grounds of the hotel and part of the same project as The Cave. 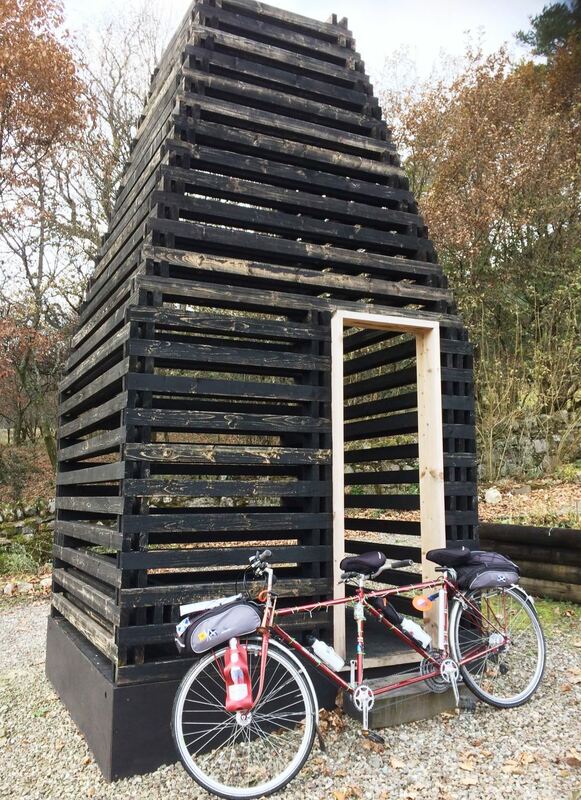 It is based on the concept of a traditional Scottish shepherd hut. Slatted wood enables a unique view of the landscape and the ever changing light creates interesting ladder shadows. The Sheiling is based on a traditional Scottish shepherd hut. Perfect for an “old lady” like me – parked at the boutique Monachyle Mhor hotel. Oh I was so pleased, as I do like compliments you know! The “old gal” and the “old git” were welcomed in like old friends and immediately made to feel comfortable despite being kitted out in cycling gear! They took a seat in the small and cosy snug bar – with its trendy new bar amazingly fitting in to the old fashioned surroundings including an old metal fireplace with a healthy fire glowing away! Perfect tandemers lunch! Soup, sarnies and prosecco! What could be better? 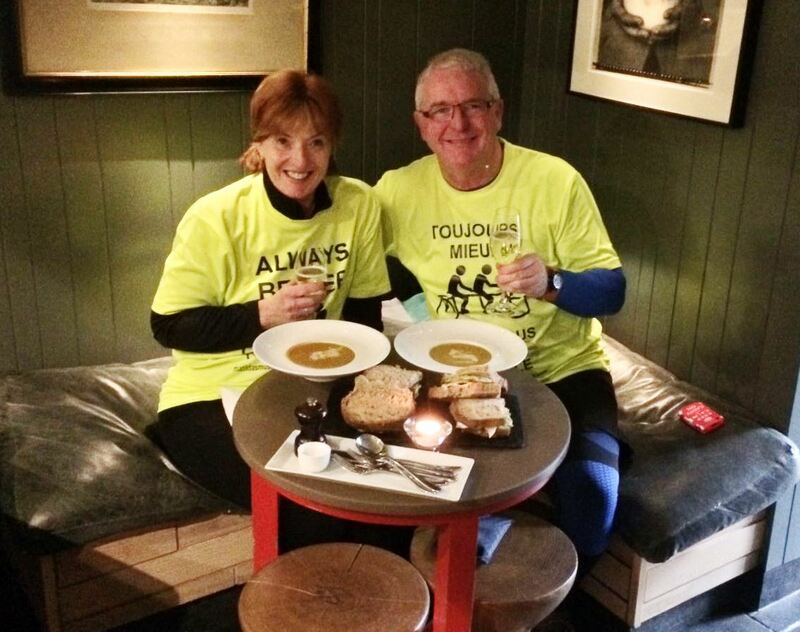 My dynamic duo then enjoyed some most welcome hot soup and sandwiches – along with a reviving glass of prosecco! I mean it would have been rude of them not to! The “old git” had a bit of a job persuading the “old gal” to done their jackets and go back out into the cold – me thinks she could have easily stayed there all afternoon! In fact she was dragged away saying: “Mhor, mhor mhor!”! As the temperature started to drop my dynamic crew decided to pick up the pace in a bid to keep warm and tandemed back towards Balquhidder in double quick time. I was most impressed as they still have that fitness built up for our summer trip – and easily nailed some hilly terrain. 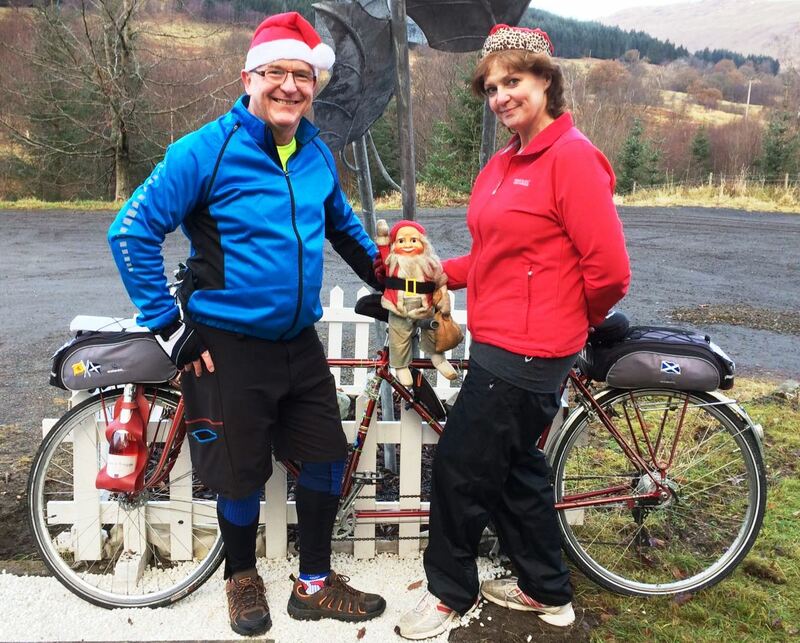 We tandemed through Balquhidder and back up to the junction with the A84 where the “old gal” decided my crew needed to thaw out and have the traditional cyclists treat of coffee and cake at Mhor 84. And that allowed me to be introduced to the Mhor Coo, the last of our features on the BLiSS trail. It seems the popular local coo moooves around (get it?!) at the motel. But I easily found it beside the Christmas tree at the front door! As the last feature of our BLiSStrail trip I got to meet the Mhor Coo! 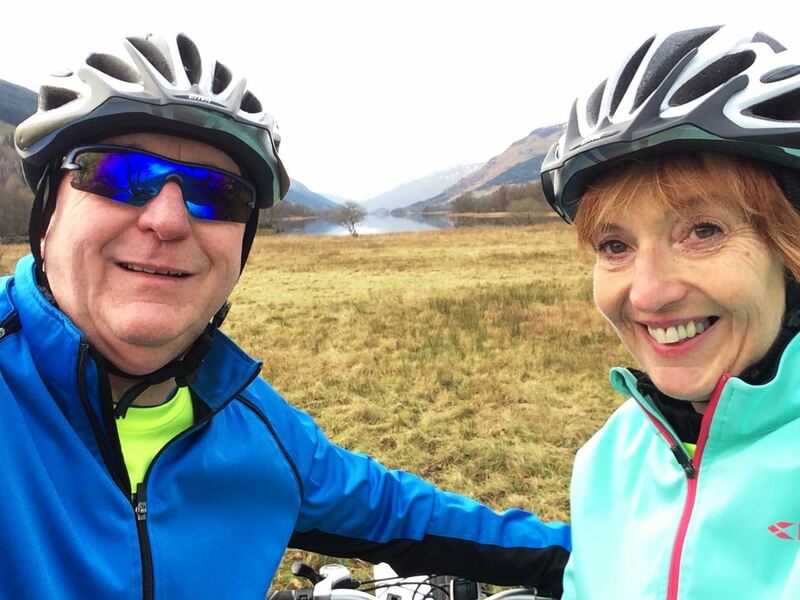 Over a warming coffee, the “old git” and the “old gal” reflected on what a marvellous idea the BLiSS trail is and how it offers the perfect opportunity for some culture and cycling! No wonder it won the regional Scottish Thistle Award! And of course Team Matilda wishes the LETi team the best of luck in the national finals in March next year. 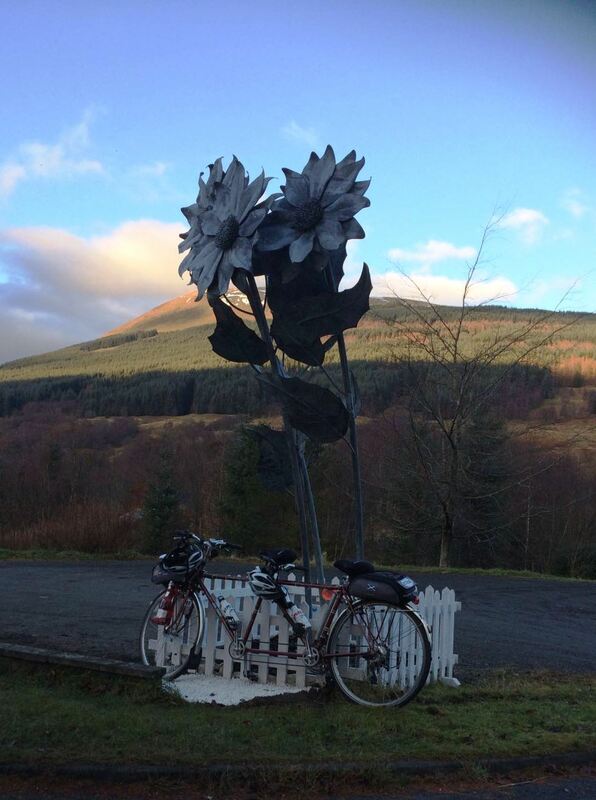 Before then I am delighted to say that I have already been invited back to complete the third and final leg of the BLiSStrail – this time around Strathyre. The plan is to do that in January or February. I for one can’t wait and I know my dynamic crew are looking forward to it too! As dusk fell, and the temperature fell well below zero, the “old git” suggested one final photo – a festive shot with my Christmas lights lit up and my crew donning Santa hats! Then it was a rapid last mile back to the warmth of Matilda Transport and back to Matilda’s Rest. All in all it certainly had been a BLiSSful and brilliant bravura in Balquhidder! The “old git” and “old gal” decided to don Santa hats for the last photo of the trip. 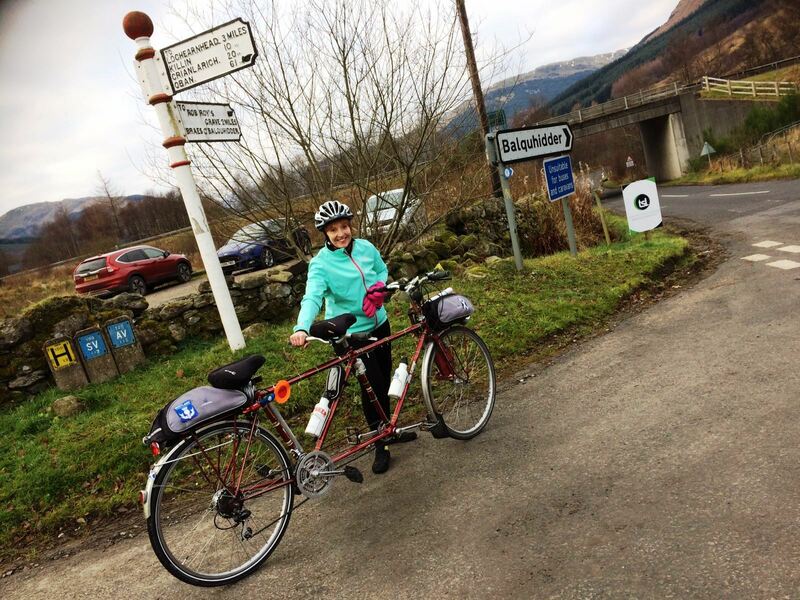 Thanks to all at LETi for their help, bed and breakfast and sustenance offered to allow Team Matilda to complete their tour of the Balquhidder leg of the BLiSS trail. ← So here it is … lighting up for Christmas … with Slade and Abba! 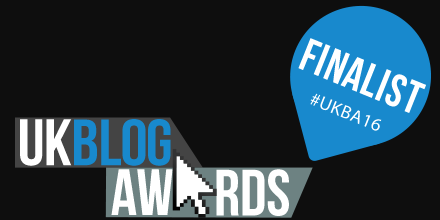 In the words of Craig Revel-Horwood – Fab-u-lous darrrrhling. What a fab trail and it sounds like everyone had a ball. Well done Kim for being so brave too. 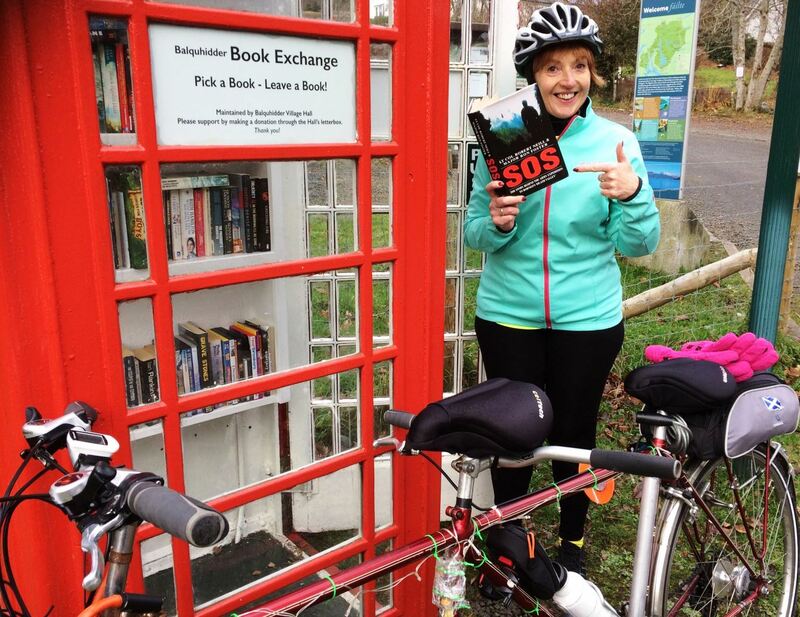 I have to say the phone box book exchange is genius! What a great idea. The Look Out has been on my list of things to visit this summer but I never did quite make it. Next year. Looking forward to seeing new installations for 2017. Thanks Mel for your kind comments re my blog! 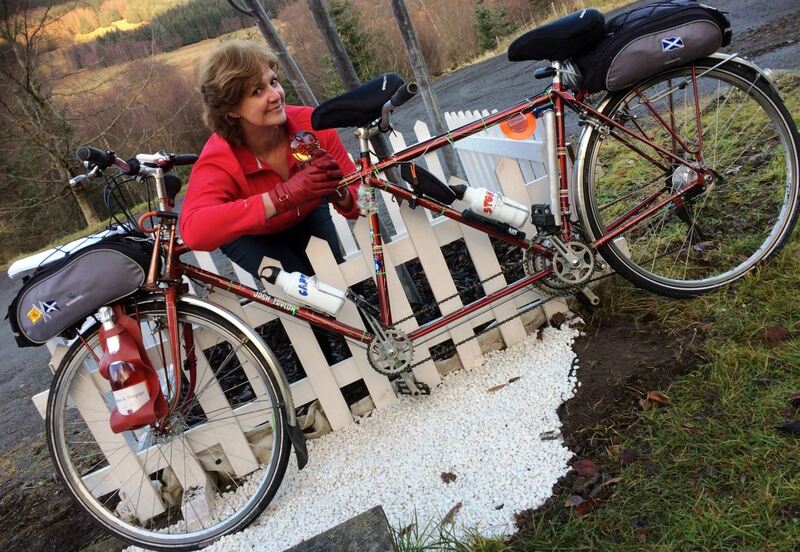 Yes this “old lady” any my dynamic duo certainly had a fantastic mini tandem break! Cycling and culture – our kind of ride! Just perfection! And shops there is something to suit everyone’s tastes! Yes Kim was brave but the “old git” was very gentle with her as it was her first time!!! Next time we do gears and tight corners! And yes you must make time Mel to get to Look out … arriving by bike is the way to do it and feel at one with nature! What a simply fabulous time you had Matilda, along with the “old gal and git ” of course. The whole trail looks so very interesting, we did see the Mirror Man and Bill Bull back in September but didn’t know the story behind them. Would love to see the rest . Who knows maybe we can squeeze in a trip north in 2017 ! Well Jane if my good friend Bluebird is even remotely thinking about a Scottish trip in 2017 then I would be ecstatic and naturally offer my services as tour guide! We will have completed the third leg by then so will have ticked them all off – just in time for a refresh of the BLiSS trail for 2017! 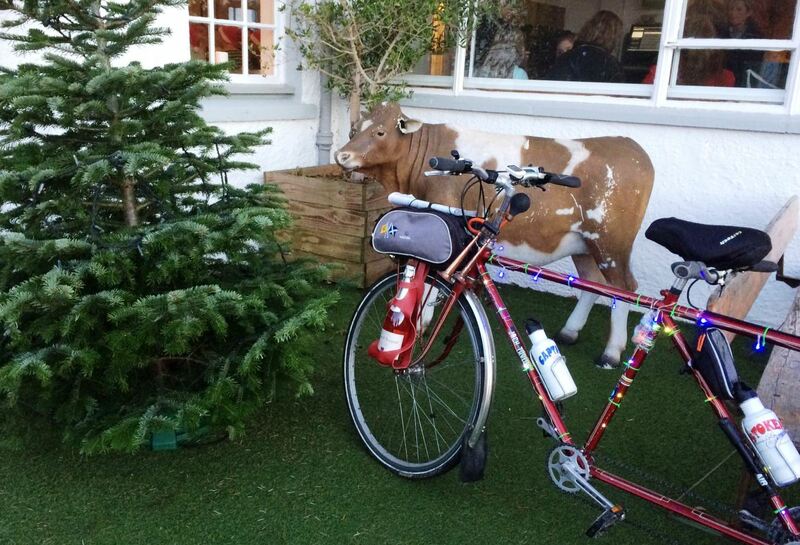 Delighted that you had fun on the BLiSS trail Matilda and thank you for taking your film crew! We are so proud to have won Visit Scotland’s regional Scottish Thistle Award for “Working Together for Tourism” however #BLiSStrail really comes alive when people visit it all year round and share unique photographs and stories like yours. Kim, this “old lady” had a fabulous time! Culture and tandeming go together like … like … nice prosecco in a cut crystal glass! 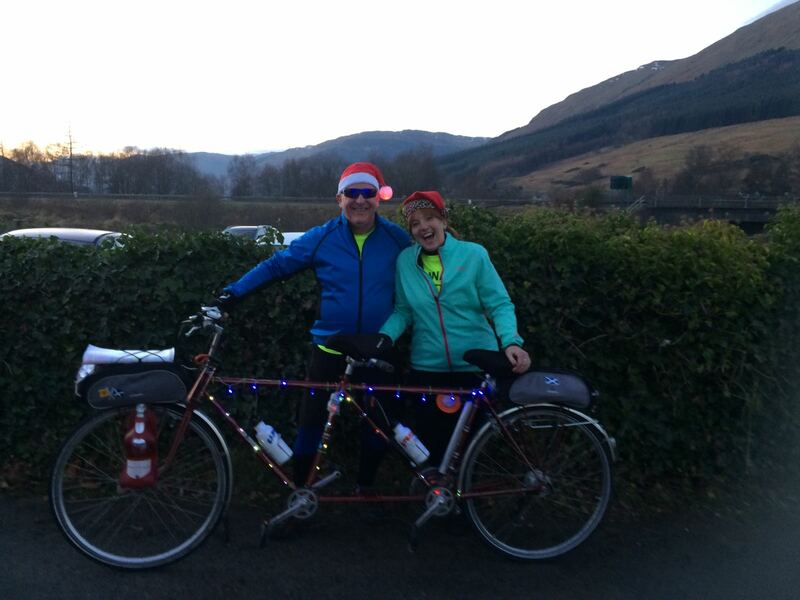 But seriously all at Team Matilda thoroughly enjoyed the Tour de Balquhidder – including some wonderful food and drink. And doing it in December shows the BLiSS trail really is an all-round attraction! I can’t wait to get back early in 2017 to do the Strathyre leg and meet the promised fun people there! And I have to say you were very good as my sub stoker … and you are welcome to have a second shot when we revisit! Maybe you should think of getting a tandem! Hi there Matty. Is there anywhere you haven’t been this last month or so ? Love the Sunflowers, Mirrors and all the other wonderful sculptures you have seen. I hope the old dears enjoyed all the things you dragged them round! Do hope you have a wonderful, relaxing puncture free Xmas ! Oh Dot it was such a hoot going round all the sculptures – and the mirrored cube was magical as it made me longer than I actually am … and a bit disappeared out my middle … and not many “old lady’s” can say that! Whisper it but the “old git” is planning a short ride this Sunday to the 15th C Tullibardine Chapel for the annual carol service – complete with Santa hats and Crimbo jumpers and I will have my festive lights switched on! Thank you for your Christmas greetings – which are naturally returned. And did you mention the p word … wash your mouth out Dot! Hello Skelbo Cyclist – glad to see you still keeping up to date with your regular doze of my tandeming adventures! But seriously thanks for your kind comments … but why “very trusting of the local lass”?! The Captain is an excellent teacher and we both took it gently as it was her first time! Maybe you can have a shot the next time when we “Voil meet again” – hopefully in New Year! And glad you liked my Crimbo card!